Both sides remain unbeaten after the goalkeepers showed their quality in front of the BT Sport cameras. There was no shortage of chances in the early evening kick-off but Fylde number one Jay Lynch and his Harrogate counterpart James Belshaw were both determined not to be beaten. Fylde named the same side that had played out another goalless draw two days earlier at Sutton United, though Jordan Tunnicliffe was named among the substitutes after injury. After a cagey opening , the first chance of the game went to the hosts on 19 minutes, when a corner fell to Ryan Croasdale 10 yards out but he could not keep his shot down. The visitors created their first opening two minutes later, when George Thomson's low drive was comfortably saved by Lynch. 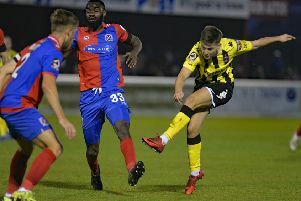 A claim that Rowe was held back in the box did not impress the referee and Fylde survived a scare at the other end on the half-hour, when former Coasters forward Jack Muldoon beat Zaine Francis-Angol but found no takers for his cross to the back-post. James Hardy was becoming more of a threat and he pulled the ball back for Fylde's Andy Bond to shoot just over from the edge of the area. The chances began to come thick and fast towards the end of the half as Thomson's effort for Harrogate just missed the top left corner, then at the other end Danny Kane's close-range effort was saved by Belshaw. That save was topped by Lynch three minutes before the break, when he rushed out to block Dominic Knowles' effort. The last action of the half saw Rowe's low effort from 25 yards saved by Belshaw. Serhat Tasdemir replaced the injured Joe Cardle for the second half but the first shot in anger came from Harrogate, Lynch saving from Thomson. Belshaw produced heroics at the other end on 49 minutes to tip Hardy's effort over from Luke Burke's low cross. Joe Leesley headed wide for Harrogate, then just past the hour Lynch made another fingertip save from a Town corner. The Fylde keeper was then booked for handling outside his area. Both keepers were determined not to be beaten as Belshaw denied Rowe again when the striker was first to Croasdale's cross. Lloyd Kerry volleyed over for Harrogate, set up by substitute Mark Beck, and Leesley could have done better with a cross to the back post as the clock ticked down, though the draw was the fair result. Fylde remain third in the National League and Harrogate fourth, two points behind new leaders Halifax. Fylde; Lynch, Francis-Angol, Burke, Byrne, Kane, Bond, Croasdale, Kellermann (Toure 71), Hardy (Hemmings 89), Cardle (Tasdemir 45), Rowe; not used: Birch, Tunnicliffe.